This is the first time I had been back to Earl's Court after the refurbishments. I was very impressed - the bathrooms are much improved and the new beds very comfortable! When would you like to stay at YHA London Earl's Court? Just a short walk from Earl's Court Underground station, YHA London Earl's Court is really easy to find and makes for a convenient base for a cheap London break, whether you’re a domestic guest or from overseas. 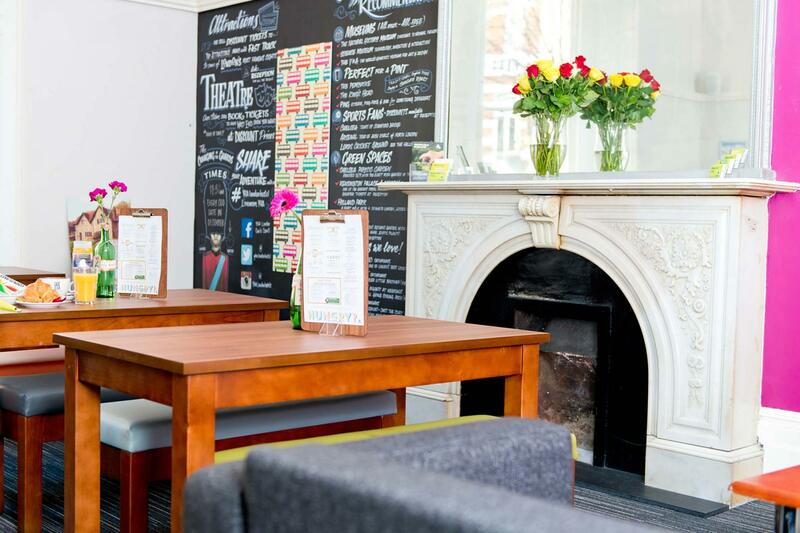 Situated on an affluent residential street, the hostel is a gorgeous Victorian building and boasts a courtyard garden which guests can make the most of during the summer. Close to close to Olympia, Kensington Gardens, Hyde Park, the Natural History Museum and the Royal Albert Hall, the surrounding area has attractions aplenty to enjoy! Plus, if shopping is your thing, treat yourself with a visit to a number of Knightsbridge's flagship stores. This 186 bed backpackers' hostel boasts modern facilities and comfy social areas - great for meeting up with your fellow travellers and sharing stories about your adventures in the capital. The Youth Hostel is completely secure, with key card access to floors as well as rooms, so you can rest easy. We've recently made some vast improvements to the hostel including the complete refurbishment of the self-catering kitchen, redecoration of the social spaces making them even more relaxing, full replacement of all toilets and showers and we've replaced the old wooden bunk beds with brand spanking new metal ones. The bedrooms are clean and minimalist in design, with en-suite and family rooms available for your convenience. There's plenty of storage and wooden lockers to keep all your bits and bobs inside. Our hostel also includes a computer area, a laundry with coin-operated washers, and a lounge and dining areas. YHA London Earl's Court is great cheap accommodation for family breaks in London or for solo travelling, with its friendly and inclusive atmosphere. If you're looking for some outside space in central London to relax in then look no further. We've got a garden outside with picnic benches which is perfect for alfresco dining and sunbathing during the warmer months. Get ready for a busy day exploring the capital with our delicious continental breakfast. Your breakfast includes croissant, fruit, your choice of yogurt, a choice of cereals, fruit juice and Fairtrade tea or coffee. In a rush? Breakfast is served from 7am – 9am and you can get up to 15% off breakfast as part of your online booking. We offer a fantastic range of stone-baked pizzas as well as delicious nachos throughout the day, pick from our menu or choose your own toppings. Rub shoulders with Kylie Minogue and the Beckhams, have your photo taken with the Queen or scream in the Chamber of Horrors. One of the most famous tourist attractions in London. Prudential Ride London is an annual 100 mile cycling trip. Starts every day in Green Park at 11am. This free guided London walking tour is the perfect introduction to London history and the area often referred to as “royal London”. This Camden Markets and Music Legends Tour is no ordinary walking tour. Discover London’s most creative and culturally diverse area. There are many ways to explore a museum. Parking: There is no parking at YHA London Earl's Court. Public transport links in London are very good - it is easy to get around the city using the London Underground or bus service and so we would advise parking outside the centre. Pets: Pets are not permitted at YHA London Earl's Court. Assistance dogs are welcome. The building was originally a family home before it became a finishing school for 20-25 young ladies - where there were more staff and servants than young ladies! The school closed for a time and was then re-opened by the previous French teacher before it became a hotel. YHA has operated the building as a Youth Hostel for more than 55 years. Manager recommends: If you're on a quick weekend break, or just in London for a day do The Original Bus Tour and see the sights.